It’s that time again, football season! It seems like every time I walk by the T.V. in the family room, there’s a game on. Now I’m not really into sports. I’ve tried, I really have. My Dad loved football, baseball, basketball, and even bowling. I think he watched every sporting event that ever aired on T.V. But for the life of me, I just didn’t get what all the fuss was about. But what I did always love about football season was football foods, tailgating foods, and any other type of delicious munchies you can eat while watching the game. So when my husband has the game on, I retreat to the kitchen and do what I love to do, cook. My family loves anything that’s buffalo chicken related. I’ve made all types of buffalo chicken recipes. I’ve even made a buffalo chicken meatloaf and buffalo chicken egg rolls that were a huge hit. But the other day I wanted to make something really quick, so I put these little bites together. I had some leftover rotisserie chicken that I shredded. I then added that chicken to some Athens Mini Fillo Shells. These shells are amazing and so versatile. 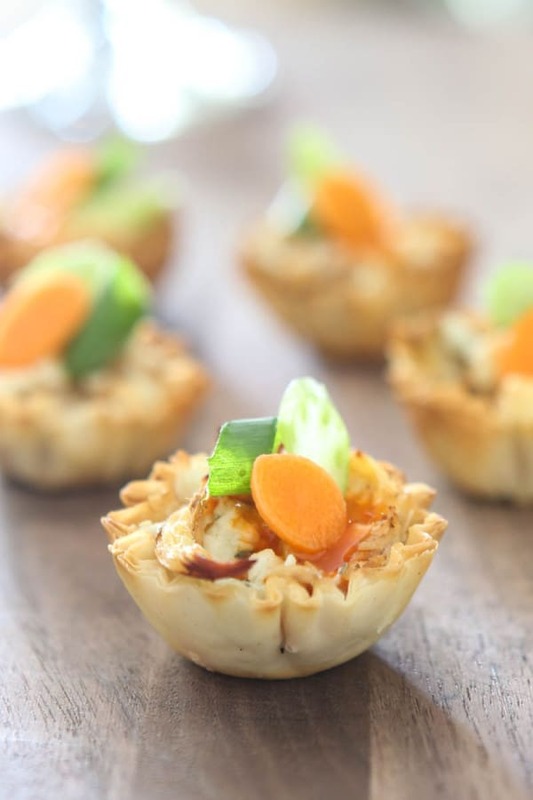 You can make lots of different types of savory bites like these and many different delectable desserts too. After the chicken was added to the Fill Cups, I then added some crumbled blue cheese and popped them in the oven and baked them until they were warmed through and the shells were crispy. When they came out of the oven, I topped them with a little jarred buffalo wing sauce. Next I added a garnish of thinly sliced carrot, celery and green onion. This makes them so cute and taste wonderful. These are easy enough to make on a Sunday afternoon while watching the game, but also impressive enough looking to make for entertaining. Find consumer recipes and a recipe contest at www.phyllo.com! To find their favorite recipes, visit their Pinterest page at www.pinterest.com/athensfoods. Divide shredded, cooked chicken to Athens Fillo Cups evenly. Top with crumbled blue cheese. Follow package directions to heat Athens Fillo shells, cooking them until golden brown and crisp. Garnish each Fillo Cup with a teaspoon of buffalo wing sauce, a slice of celery, a slice of carrot and a piece of green onion. Serve and enjoy! This post sponsored by Athens Foods. Al opinions 100% mine. I adore finger food. And I bet my hubby would love these for football parties! My family is like yours, we love anything with buffalo chicken! These little bites look amazing! 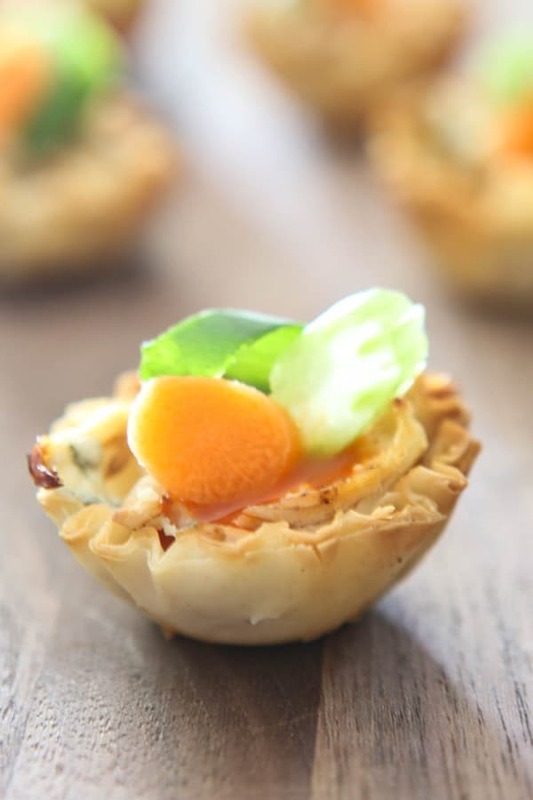 These are the cutest little bites – I could see them at a cocktail party as well as a football party! 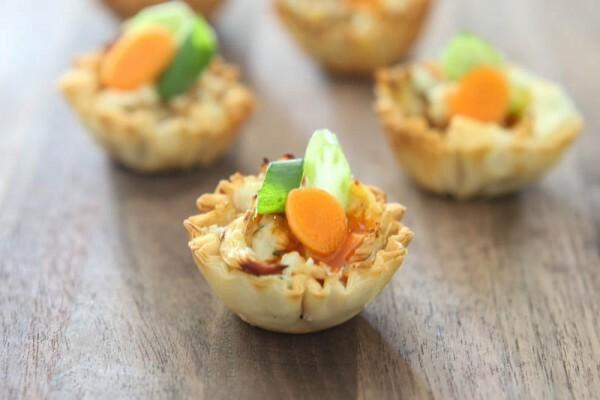 I have one kid that would love buffalo chicken bites and so would I! So cool for a cocktail party or for game day! Or really, any day, Angie! Those look almost too pretty for football food! These look so good…and I just happen to have lots of buffalo sauce on hand from making buffalo chicken meatloaf! 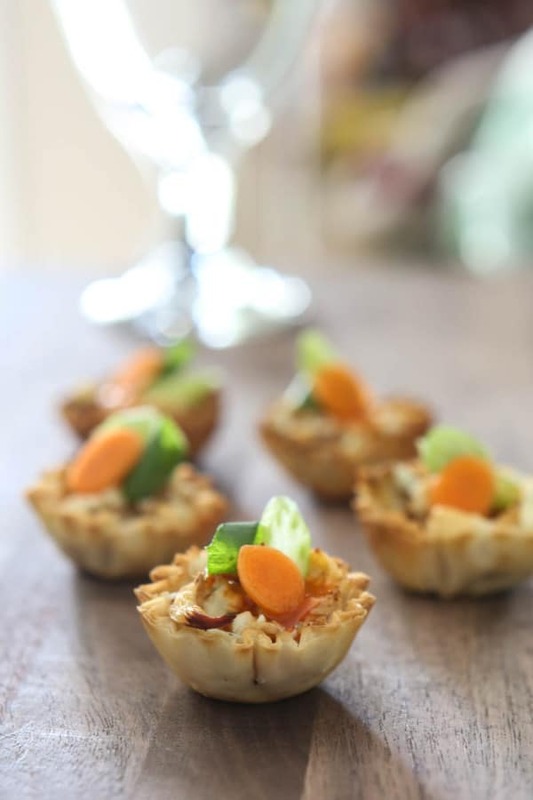 I love phyllo cups… they’re always such a big hit at parties, because you can just pick them up and gobble them up. No muss, no fuss! I normally make my own cups by cutting up the full sheets of pastry and then pressing into a muffin tin, but that’s kind of time consuming. You have no idea how excited I am to know there are pre-made cups on the market… must hunt some down! Such perfect little bites with tons of crunch and tons of flavor. I especially love that little punch of color you’ve added to the top with the carrot and green onion! Nice touch!